AT&T, DirecTV And Finding A Prom Date: Reactions To Merger : The Two-Way "It's kind of like trying to find a date before the prom," one analyst says of consolidation in the media industry. Some experts are criticizing the deal's strategy and potential impact on consumers. "I was scratching my head," one analyst says of news that AT&T will acquire satellite TV company DirecTV for $48.5 billion in cash and stock, or $95 per share. Analysts are mixed in their reactions to the deal. AT&T's plan to buy DirecTV for $48.5 billion is the latest tectonic shift in the media industry, with many viewing the deal as a response to the pending merger of Comcast and Time Warner Cable. "When I first heard the news, I was scratching my head," analyst Jim Nail of Forrester Research tells The New York Times. "Satellite is kind of a doomed technology. I don't see it being a long-term proposition." Others say the merger is part of an evolution in maturing markets, as cable, satellite and broadband companies look to combine so they can find new ways to grow. "It positions them as probably the most complete integrated telecommunications provider in the U.S.," wireless analyst Roger Entner tells NPR's Jim Zarroli on Morning Edition, "because they can provide nationwide bundles that consist of voice, Internet and TV services." In announcing the merger Sunday, the two companies noted DirecTV's assets, such as its presence in Latin America and strong sports programming such as "exclusive pay TV rights to NFL Sunday Ticket." "Strategically, this makes a lot of sense for AT&T," analyst Jan Dawson of Jackdaw Research tells Bloomberg News. He says that AT&T adding satellite TV "lets them go national with a video offering that matches their wireless reach." "It's kind of like trying to find a date before the prom. The more people get picked off, the more desperate everybody else becomes to try to find somebody they can go to the dance with." Feld adds, "As you get fewer and fewer bigger and bigger players, there is less pressure on any of them to pass on any of these savings to consumers." Antitrust attorney David Balto says the deal could benefit TV consumers, if the addition of a competitive broadband service gives DirecTV more allure. "I think it's going to make DirecTV a much stronger competitor," he says, "and this is a marketplace where we want to see the level of competition strengthened." "John Bergmayer, senior staff attorney with advocacy group Public Knowledge, warned that AT&T will need to demonstrate that new services would offset any harm to the wireless and video markets.
" 'It just doesn't make sense to me,' said New Street Research analyst Jonathan Chaplin, who asserts that AT&T would be better off buying Dish Network because of that company's wireless-spectrum holdings." 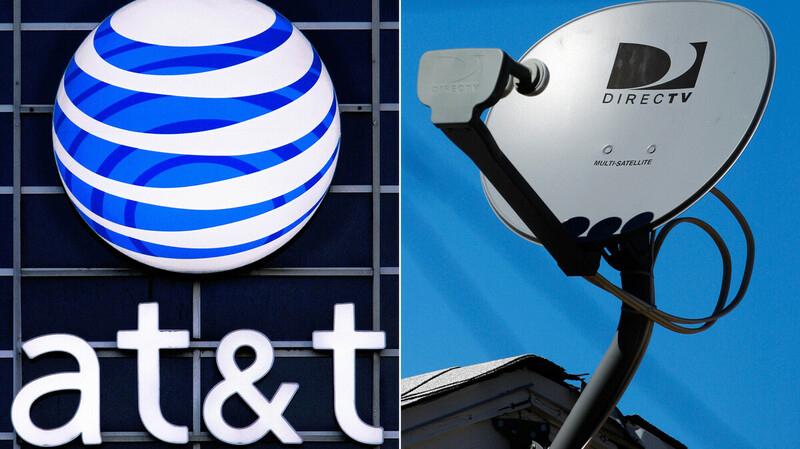 AT&T and DirecTV had been discussing a merger for long before this weekend's announcement, leading some to say it has nothing to do with the Comcast-Time Warner Cable merger. But most also agree that the two huge deals will be linked, in a very real sense, as it seems unlikely that federal antitrust regulators would approve only one of the mergers. The thinking is that when the deals are completed, only these two mega-companies would be able to counterbalance each other in the market.